Margaret Wertheim, The Fax Numbers of the Beast, and Other Mathematical Sports: An Interview with Neil Sloane, Cabinet Magazine, Issue 57, Spring 2015, pages 48-54. Siobhan Roberts, How to Build a Search Engine for Mathematics: The surprising power of Neil Sloane's Encyclopedia of Integer Sequences, Nautilus Magazine, Issue 29, Chapter 4, Oct 22 2015. Eric Egge in "Defying God: The Stanley-Wilf Conjecture, Stanley-Wilf Limits, and a Two-Generation Explosion of Combinatorics", pp. 65-82 of A Century of Advancing Mathematic, ed. S. F. Kennedy et al., MAA Press 2015, says: "When we enter our terms 1, 2, 6; 22, 91, 408, 1938, 9614 into the OEIS search box, we are rewarded with a description of the sequence .... In hindsight it's amusing that Sloane called his  book "A Handbook", as though there might be competitors. There are none, and the OEIS is a required stop for anyone who encounters an integer sequence they don't recognize. It's no exaggeration to observe that in certain parts of combinatorics, the OEIS alone has increased the rate of new discoveries by an order of magnitude." Featured by Slashdot on August 7 2015. Erica Klarreich, The Connoisseur of Number Sequences, Quanta Magazine, August 6 2015. Jeffrey Shallit, Editing an Electronic Journal, Notices of the Americal Mathematical Society, Feb. 2015, Vol. 62, Number 2, pp. 169-171, refers to me saying "sometimes known as the Father of Integer Sequences". Video interview of me by Marc Chamberland at the Joint Math Meetings in San Antoio, Texas, Jan. 2015. Gary Antonick, Celebrating 50 Years With the OEIS, WordPlay blog, New York Times, Oct 08, 2014. Alex Bellos, Neil Sloane: the man who loved only integer sequences, Alexs-adventures-in-numberland blog, The Guardian, Oct 07 2014. Doron Zeilberger, Opinion 124: A Database is Worth a Thousand Mathematical Articles: An Ode to Neil Sloane's On-line Encyclopedia of Integer Sequences (OEIS), May 22, 2012. James Gleick, Got Numbers?, Blog Entry, Feb 15 2011. Julie Rehmeyer, The pattern collector: The Encyclopedia of Integer Sequences outgrows its creator, Science News, Web Edition, Aug 06, 2010. Ivars Peterson, Deciphering Integer Sequences, The Mathematical Tourist, March 10 2010. Irena Cieslinska, Co rozpala umysly, których nikt nie rozumie?, [What enkindles the greatest intellects in the world?] (Polish), Gazeta Wyborcza, September 28, 2009. Although this article is listed here on the Gazeta Wyborcza web site in 2014 as being available, it seems to have vanished. The On-Line Encyclopedia of Integer Sequences was mentioned on the TV program Numb3rs, May 05 2006. Vincenzo Origlio, L'Enciclopedia delle sequenze intere, Biblioteche Oggi, January-February 2006, pp. 41-45. Antti Karttunen, Tuhansien lukujonojen aarreaitta (Finnish) [A treasure-trove of thousands of integer sequences], Helsingin Sanomat, Science & Nature section, page D1, Tuesday, November 9 2004. There's a nice discussion of the On-Line Encyclopedia of Integer Sequences in the review in MathSciNet by Christian Krattenthaler of my article about the database - see Review MR1992789 (2004). The Italian monthly magazine for software developers, Dev. has a piece about the OEIS in the Feb 2003 issue, No. 104, on page 72. A 1995 paper of mine on minimal-energy sphere packings has been getting publicity recently because it seems that these packings actually turn out to be useful. The On-Line Encyclopedia of Integer Sequences was listed by PC Magazine on May 27 2003 in its list of search engines. For the online version click here and click the sidebar on Niche Search. The On-Line Encyclopedia of Integer Sequences was featured in Ivars Peterson's MathTrek in Science News Online for May 17, 2003. Ivars Peterson, The EKG Sequence, MathTrek, Apr 08 2002. Heinrich Hemme, Die Leidenschaft eines Zahlenreihen-Sammlers [The Passion of a Collector of Number Sequences], Frankfurter Allgemeine Zeitung, May 9, 2001. Featured by Slashdot on Feb 22 2000. The On-Line Encyclopedia of Integer Sequences was one of Science magazine's Hot Picks for 15 May 1998. Robert Calderbank's interview with me appeared in the IEEE Information Theory Society Newsletter for December 1997.
Review by J. M. Borwein and R. M. Corless in SIAM Review (Vol. 38, 1996, pp. 333-337) of The Encyclopedia of Integer Sequences. American Scientist, Vol. 84, January-February 1996, "A question of numbers", by Brian Hayes, pp. 10-14, talks about The Encyclopedia of Integer Sequences and the sequence servers. Sunday Star Ledger, June 18, 1995, "Count him in: Bell expert tracks trends in numbers", pp. 1, 18, by Kitta MacPherson. Science News, May 20, 1995, "Next number, please", p. 319. Newsweek, January 9, 1995, "Your lucky number? ", p. 10, by Carla Koehl and Jennifer Tanaka. The sequence servers have also been mentioned in many other places, for example Spektrum der Wissenschaft, Nov. 11, 1995, p. 12; Internet World, Oct. 1994, p. 17; The Mathematica Journal, Vol. 4, Issue 3, Summer 1994, p. 30. What's Happening in the Mathematical Sciences, by Barry Cipra, "Straightening out nonlinear codes", pp. 37-40, Americam Mathematical Society, Providence, PI, 1994. Pour La Science, Septembre, 1994, "Dictionnaire de suites", p. 25. 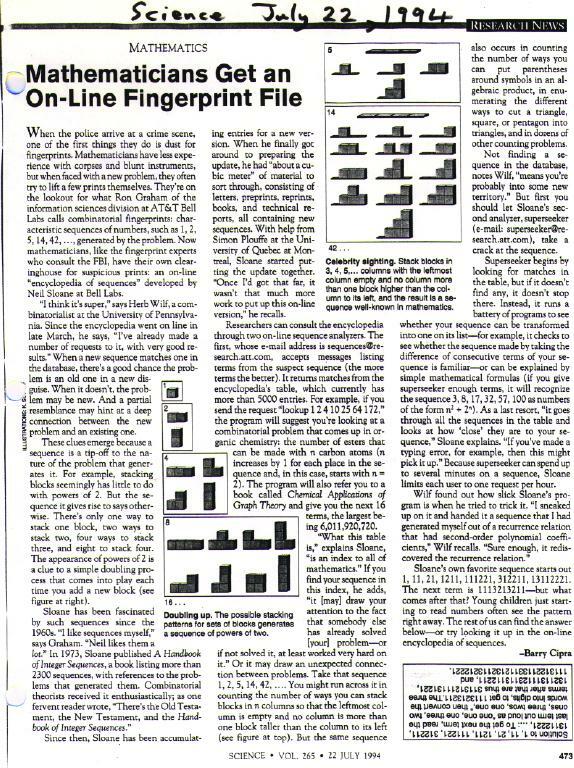 Science, July 22, 1994, "Mathematicians get an on-line fingerprint file", p. 473, by Barry Cipra. For All Practical Purposes: Introduction to Contemporary Mathematics, "Spotlight 10.2: Neil Sloane", W. H. Freeman, NY, 3rd edition, 1994, pp. 308-309.
Business Week, June 20, 1994, "Suddenly, number theory makes sense to industry", pp. 172-174, by Fred Guterl. Science, October 29, 1993, "Nonlinear codes straighten up - and get to work", pp. 658-659, by Barry Cipra. 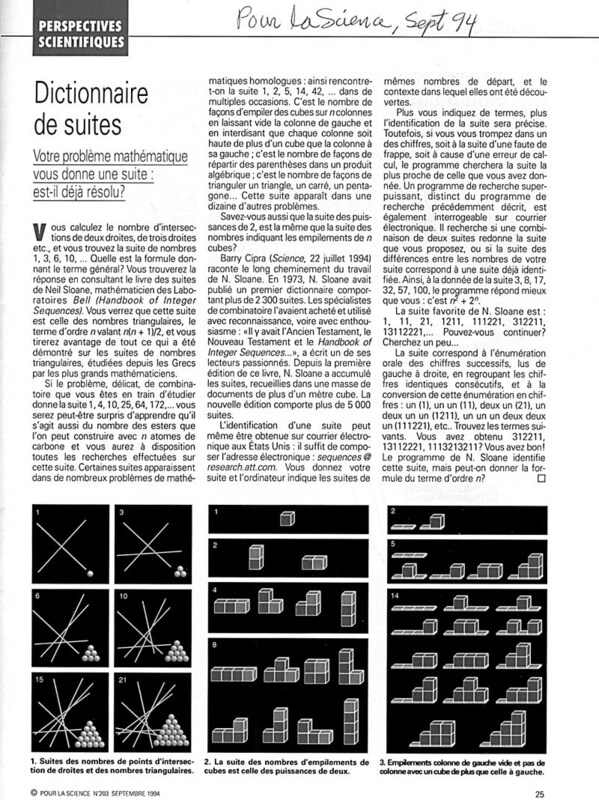 Discover, October, 1990, "Math in a Million Dimensions", pp. 58-66, by David Berreby. Omni, September, 1989, "Interview: Neil Sloane" pp. 78-83 and 96-101, by Anthony Liversidge. C. & E. News, February 29, 1988, pp. 22 ff., esp. p. 24, "Interest Grows in Hadamard Transforms for Spectroscopy", by Stephen C. Stinson. Montreal Gazette, Feb. 21, 1987 p. J7, "Among sequence buffs, this man's No 1: (Neil Sloane)". New York Times, Tuesday, January 27, 1987, front page of Science Tuesday section, "In a `random world', he collects patterns", by James Gleick. (The picture shows an extract from the first page, with the error in the third example corrected in red.) Added Dec 16 2009: The full text of the article (but not the illustrations) can now be seen on the New York Times web site. Forbes, December 29, 1986, "The nth dimension", pp. 94-95, by William Baldwin. Scientific American, April, 1974, Review of ``A Handbook of Integer Sequences'', pp. 125-126, by Philip Morrison.